1. Start by making the jam. Chop the apricots into small pieces and, if you have a nutcracker, split open the stones to release the nut. These have an almond-like flavour. 2. Place the chopped apricots, sugar, lemon juice, vanilla pod and nuts (if using) into a medium-sized heavy-based pan over a medium-high heat with 50ml cold water. Allow the fruit to simmer and soften for 15-20 minutes, stirring often. Test whether the jam is ready by spreading a small amount on a cold plate. Leave it to cool, then when you push it with the back of a spoon it should be set and start to wrinkle in the middle. Remove the vanilla pod (this can be dried and used again) and set the jam aside. 3. Preheat the oven to 170°C, gas mark 3. Grease a 12-hole muffin tray with butter. Place the sugar, flour and bicarbonate of soda into a bowl and combine. 4. In a small jug, mix the butter, yogurt, eggs and vanilla. Pour the wet ingredients into the dry ingredients and gently fold together until just incorporated. 5. Divide the mixture between the 12 holes, then bake for 15-18 minutes or until golden brown and risen, and a skewer inserted comes out clean. 6. 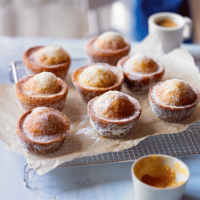 Roll the hot duffins in sugar, then make a small hole with a skewer in the bottom of each and pipe the jam into the centre. These are best enjoyed fresh from the oven.